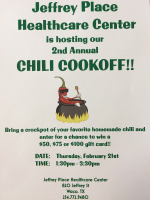 2nd Annual Chili Cookoff hosted by Jeffrey Place Healthcare Center - Bring a crockpot of your favorite homemade chili! Judges will award 1st Place - $100 Gift Card, 2nd Place - $75 Gift Card and Third Place - $50 Gift Card. No registration required. Questions - Call 254.772.9480 and ask for Maci or Joanie.